In the last week of 2012, I was out of town visiting Istanbul with my friend. Istanbul has always been one of my favorite cities in the world, if not the most. It’s vibrant and alive even during the coldest days of the year and latest hours of the night. It’s ancient and charming, walking in its streets is like being in an open-air museum that takes you in a journey from a historical era to another. The food experience in Istanbul was excellent. Turkish food is variant, rich, and delicious. And of course it has a lot in common with Levantine cuisine. 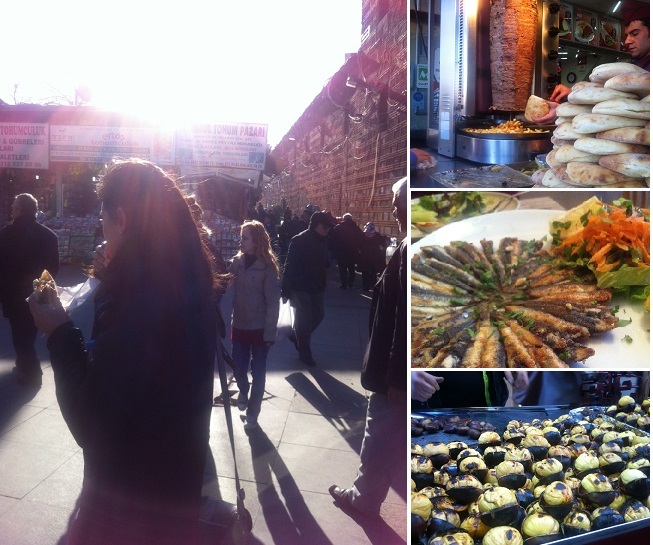 Street food in particular is available everywhere in Istanbul, Its inviting and safe. One cannot resist having a cup of fresh pomegranate juice squeezed from three large pomegranates. Or to buy a bag of instantly roasted kestane (chestnut) from one of many street stands. Or even to have a sandwich of hanging kebab skewers soaked in its fat. But the thing we could not resist the most was the the daily morning aroma that came out from bakery stands. We had cheese pies in the first morning, beef pies in the second, cheese pies again in the third and so on until we left. On the 30th of December we were supposed to go back to Amman (where we live), but in the last minute plan has been changed and we headed to Beirut instead. The plan basically was to spend two days with our Lebanese friends who happened to be in Beirut over the holiday. They invited us to stay at their house that turned into a home because of the friendliness and the generosity we have received from their family. On New Year eve, the family and neighbors gathered in our friends place. All kinds of Levantine homemade foods were served. Early in that day, Salima (the mother who happened to be a Palestinian from Nazareth) started to knead dough, and spent all day in the kitchen preparing food. For me, it was very tempting to get myself into that kitchen and watch. So that is what I did, and I got to learn how the meat pie (meat on dough) is done the right way. Here are some pictures I took while Salima was preparing it. The meat pies were very delicious. So I took the recipe and tried it when I came back to Amman. I made some changes on the pie final shape in order to become easier to prepare. In a medium size bowl, combine flour, salt, milk powder, yeast, and vegetable oil. Rub the mixture together until oil is well combined into the flour. Add 1 cup of warm water gradually while kneading using one hand. Add another quarter cup of warm water if the dough is still too dry. Add some vegetable oil to your both hands and try to form the dough to a ball. Cover the bowl with plastic bag and leave it in a warm dark place for about 40 minutes to rest. *if the dough got too sticky at any time, add some flour. Meanwhile, combine all filling ingredients in another bowl except for the pine nuts and put it aside until the dough is ready. 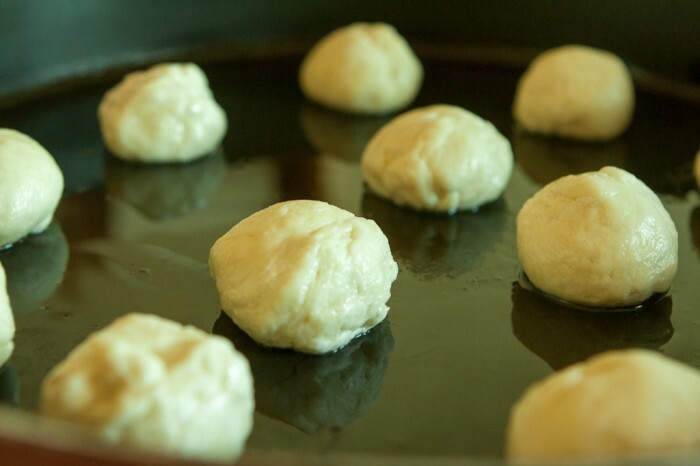 Cut the dough into egg size balls and put them in a pan greased with vegetable oil. Spread dough balls a little, enough to add 1 tablespoon of beef filling to each of them. Add couple of pine nuts to the dough pieces. 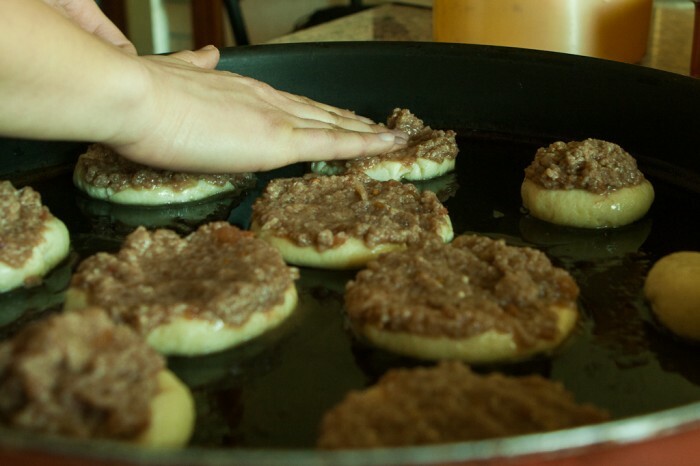 Press the beef filling firmly into the middle of dough pieces. 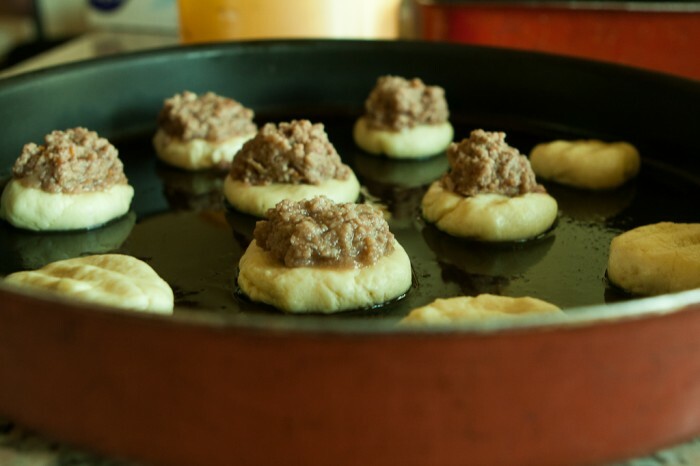 Place the pan in the bottom shelf of preheated oven for about 10 minutes or until the dough pieces are golden. Place the pan in the middle shelf to get a golden color from the top for about 5 minutes. Serve hot. 13 Comments on "Meat Pie (Lahm b’Ajeen)"
I loved the post ! It was so much fun cooking with you (or actually in your presence). I usually bake it on 180 to 200 degrees c on the bottom shelf of the oven. What is the name of the purple seasoning used in a recipe similar to this? Anyone help me out here? Purple seasoning? Do you mean pomegranate molasses? It’s used in this recipe. Lisa, I think you are talking about Sumac which is kind of purple/red spice! Sumac brings sourness to dishes and can be added to meat pie too! 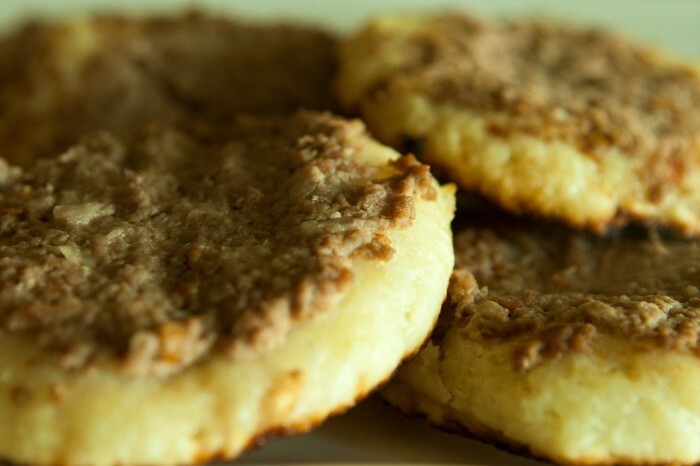 Eman thank you for this recipe, I am French and my husband is Palestinian, I am going to try this recipe tonight and I am sure it is going to taste delicious!